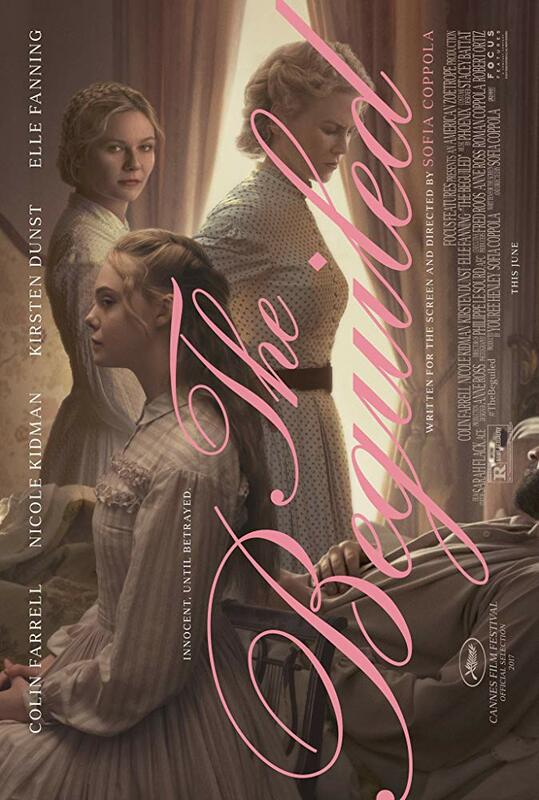 Cast: Nicole Kidman / Kirsten Dunst / Elle Fanning / Colin Farrell. Content Advisory: R for violence, some gory images, and strong sexual themes and innuendoes. I love this movie's trailer. You could say I was beguiled before I even started watching ;) And you could also say that I quickly became un-beguiled when I actually watched the movie. Darn. The dialogue is not great, the cinematography is average (there are some beautiful shots, but also a lot of sloppy ones), and the aesthetic is bleak: a merge of dusty pinks, smokey whites, greys, and dark greens. All the same, it's not quite the atmospheric, Gothic setting that I imagine it's supposed to be. The movie is frustrating because it doesn't live up to its potential. The concept is brilliant, absolutely brilliant, and it's a very, very strong idea. Apparently it's also based off of a 1966 novel and a 1971 film starring Clint Eastwood, but I doubt this latest remake will make much of an impression alongside its predecessors. It has insane potential. But the plot is not tight enough - especially not for a thriller - and if it had followed more of a "cause and effect" procedure and had not left its scenes so episodic, then I think the structure would be so, so, so much stronger and the suspense and foreboding amplified. That's what this story deserves. The acting, despite that A-list cast, is underwhelming. Farrell is the strongest, but if the characters had been more fleshed out and better developed (or developed at all), then the actors would have had more to work with and their performances wouldn't have been so contrived. It's the fault of the script. After all, I'm not gonna blame Kidman. She, more than anyone, deserved better. The Beguiled isn't as bewitching as it claims to be. Despite its raw sexual intensity, the story is squandered as a result of forced performances and an extremely weak script. The WIP Diaries: I answer questions from you!